The Belgian was on target for the first time this season as Chelsea recorded a 4-1 win over Bournemouth. Hazard scored Chelsea's second today. EDEN HAZARD SCORED his first Premier League goals of the season as Chelsea got back on track with a 4-1 victory over Bournemouth. Hazard returned to the starting line-up at Dean Court after a five-game absence with hip and groin injuries and the Belgium midfielder finally provided a glimpse of the vast talent that made him Footballer of the Year last season. He netted Chelsea’s second to end a barren run of 29 league games without a goal stretching back to May and then bagged another in stoppage-time. The 25-year-old, whose only two club goals this term had come in the FA Cup, has been well below his best this term amid rumours he could be sold in the close-season, so this was a welcome return to form. Pedro Rodriguez had opened the scoring for Chelsea and, although Tommy Elphick got one back for Bournemouth before the break, Willian struck in the second half to put Guus Hiddink’s team on course to end their two-match losing run. Chelsea’s second win in their last eight games in all competitions also owed a lot to Cesc Fabregas, another of the club’s major underachievers this season, as the Spain midfielder set up three of the goals. Nine months ago, it would have been impossible to imagine Bournemouth hosting Chelsea in the final weeks of the season with a chance to draw level on points with the reigning champions. Having beaten Chelsea 1-0 at Stamford Bridge in December — an embarrassing result that pushed then Blues boss Jose Mourinho closer to the sack less than two weeks later — Bournemouth were looking for a memorable double over the west Londoners. But it was Hiddink’s side who seized the early initiative as Pedro opened the scoring with his eighth goal of the season in the fifth minute. Chelsea broke away through Diego Costa and the striker picked out Fabregas, who slipped in Pedro down the right side of the penalty area. The former Barcelona winger was coolness personified as he left his marker flat-footed and hooked a fine finish past Bournemouth goalkeeper Artur Boruc. Eddie Howe’s team responded well and squandered a golden opportunity to equalise after Chelsea goalkeeper Asmir Begovic failed to collect a corner, only for Steve Cook to fire over from just six yards. Lewis Grabban tested Begovic with a powerful strike and then flashed a header narrowly wide as Bournemouth kept pressing, but Chelsea caught them on the break against the run of play in the 34th minute. Fabregas was the catalyst with a clever backheel to Hazard, who quickly assessed his options before driving a low 20-yard strike past Boruc. 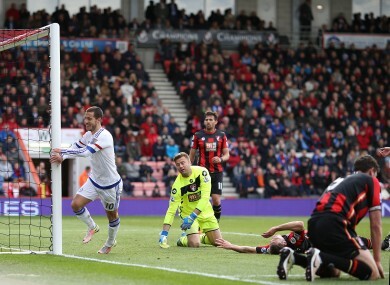 Bournemouth got one back immediately through Elphick, who rose above two Chelsea defenders to plant his header past Begovic in the 36th minute. It took a fine save from Begovic to deny Grabban an equaliser, while Nigeria midfielder John Obi Mikel, looking uncomfortable as make-shift centre-back, escaped conceding a penalty after bundling over Grabban just before half-time. Hiddink’s team were back on the offensive after the interval and Fabregas and Pedro saw shots deflected wide. The Blues’ pressure was rewarded with a third goal in the 71st minute when Brazilian winger Willian slotted home from a Fabregas pass. Hazard capped the victory in stoppage-time when he converted a Nemanja Matic pass to leave Chelsea wondering where that kind of display had been all season. Email “Like buses, Hazard broke his Premier League goal duck after 356 days... then scored another”. Feedback on “Like buses, Hazard broke his Premier League goal duck after 356 days... then scored another”.